The «Nordic Olympic» around 2nd November entered the Bering Strait after a voyage through the Russian Arctic shipping route. Six days later did sister ship «Nordic Oshima» follow in its wake through the strait that leads from the Arctic Ocean to the Pacific, information from the Northern Sea Route Administration shows. Onboard was up to 80,000 tons of ore from the Mary River Mine in northern Canada. The ships, both of them 1A ice-class carriers built in 2014 and 2015, belong to the Nordic Bulk Carriers, the Danish shipping company that has long experience in transshipments on the Northern Sea Route. «We have done 20 operations on the NSR,» says Managing Director Mads Boye Petersen. But he admits that it is the first time that company ships sail from Arctic Canada to Asia via the Russian northern route. «We are doing two voyages on the route this year. In 2019, we hope there will be more,» Petersen says to the Barents Observer. He is optimistic that macro-economic conditions will improve and that sailing on the route will become more profitable. In 2010, the Danish company made it into the history books when its bulk carrier «Nordic Barents» sailed from Kirkenes, Norway, to China with 70,000 tons of iron ore concentrate from the Sydvaranger mine. The two 225 meter long bulk carriers «Nordic Olympic» and «Nordic Oshima» in early October left Baffinland’s port of on the northern tip of Baffin Island, sailed south of Greenland and then chose a course north of Iceland. The former vessel is now in the Russian port of Nakhodka, while the latter on 15th November sailed past Kamchatka with course for the same Russian port, data from ship tracking service MarineTraffic shows. More NSR shipments from the Canadian Arctic mine could follow. 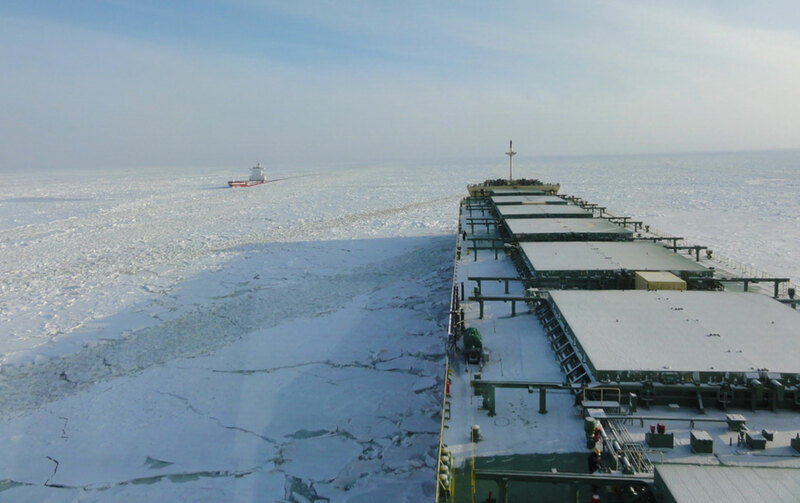 According to the mining company, about 5,1 million tons of iron ore was in the course of 2018 shipped from Baffin Island to markets in Europe, Taiwan and Japan. That is a 20 percent increase compared with 2017. Seventy-one voyages were executed, carrying an average of 71,750 tonnes of iron ore each over an 86-day period, Baffinland informs. The first shipment from the mine took place in 2015.